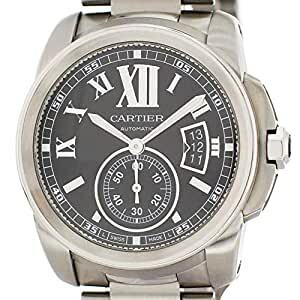 Cartier Calibre De Cartier 3389 / W7100016 Men’s Watch. 42 mm stainless steel case with smooth bezel. Black dial with date display at the 6 o’clock position. Luminous hands and markers. Stainless steel band with a push-button hidden butterfly clasp. Will fit up to an 8-inch wrist. Calibre 1904-PS MC automatic self-winding movement with a 48-hour power reserve. Sapphire crystal glass. Transparent case back. This watch is backed by our one year warranty.. Buy with confidence knowing each timepiece goes through the same rigorous 31-point inspection. Rest assured only authentic parts straight from the manufacturer are used. The Certified Pre-Owned Program on Amazon ensures peace of mind and transparency via standardized reports and a 1 Year Warranty Provided by WatchFacts.